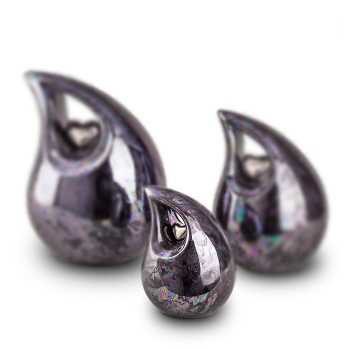 This ceramic heart teardrop urn is all glazed with a silver heart motif in its centre. Cermists blend specially selected ingredients, which after firing, becomes rigid and highly resistant to impact and wear and tear. This urn can be engraved. Supplied in a velvet pouch. This is a smaller urn and can be used as a dog or cat urn.